A trip to Aruba hardly sounds like a workout, unless it means pumping your biceps at the slot machines. But if you manage to pull yourself away, as I frequently did, from the main town of Oranjestad and it's warm, breezy beaches, plenty of calorie-burning hikes as well as interesting sights loaded with natural beauty await. 1. Arikok National Park provides plenty of hiking opportunities in a dramatic arid land laden with rolling hills. I walked many of the cacti-lined paths that wind past boulders, crevices, rock outcrops and the bizarely-shaped divi-divi trees. Here I found dozens of marked trails leading to caves with petroglyphs dating thousands of years ago, ruins of gold mines, and a re-creation of an island settlement from 200 years ago. 2. Both Ayo and Casibari are littered with oddly-shaped giant boulders. I followed the dirt paths and stone steps up and over and between the boulders of Ayo. The giant rock formations, covered with petroglyphs, seem so out of place, as if they were just dropped on the arid landscape, that you won't wonder why it's often referred to as the "Stonehenge of Aruba." 3. 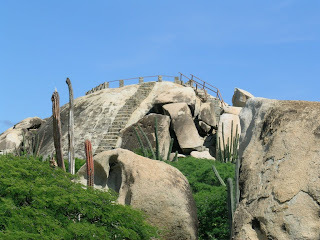 Climb steep often narrow stone steps to the top of Casibari for a view of the surrounding cactus garden and of Haystack Mountain in the distance. 4. At the center of the island, Haystack Mountain (Mount Hooiberg) can be seen from almost anywhere. After climbing several hundred stops to the summit of this cone-shaped volcanic rock, I was able to glimpse the coast of Venezuela, a view that's only possible on a clear day, in the distance. 5. The highest point in Aruba, Mt. Jamanota, can be reached by driving part way up and then taking one of the dirt paths to the top. 6. Many visitors don't realize it but Aruba has some great bird watching options. For example, not far from Orangestad, Bubali Pond, a bird sanctuary, provides plenty of opportunities to spot herons and egrets. 7. Getting to Natural Pool isn't easy: it requires at least a brisk half hour walk once you park the car or some serious off-roading where your vehicle has to navigate over a heavy-duty rocky surface. But this off-the-beaten-path pristine pool is worth it. Here you can snorkel, swim or just hang out on the rocks on the windward coast enjoying the views. You'll feel like you're completely isolated from civilization, which you are. I enjoyed your post about healthy travel tips (which brought me to this site) and I wanted to tell you so but there was no comment section. I only disagree with a couple of your recommendations -- one is that drinking bottled water is bad for the environment and also because the water is sitting in plastic, which is an endocrine disrupter. Better to bring an empty travel mug through security and fill it with tap water when possible or at least the bottled water from the plane from the big bottle. The other is that many nutritionists believe there is nothing wrong with eating a little butter and or cream. I have to agree with them. The problem is everything else in one's diet, and overeating. But a soup made with cream is perfectly okay, if it is rich in vegetables and high in nutrients and you don't eat an enormous bowl of it. Look at French women--they are often trim and healthy but they eat high fat diets... Children, especially, need fat for their brain development. But your article was excellent and I enjoyed it very much. Hi Jennifer, nice to hear from you. Thanks for your comments. I guess you saw my healthy travel tips as a guest blog, which is why there were not comments on this blog where it wasn't posted. However, you certainly can comment on the tips at the guest blog site where you saw it. No worries, though. I appreciate you visiting here. What intereting geography in the Aruba photo! I would love to visit there someday. Hi Martha, Yes, Aruba has some interesting geological features. Thanks for visiting and hope you get to travel there sometime. Your post on Aruba is so descriptive I really feel like visiting. Thanks Shanthy and Gaston Studio. Glad you enjoyed the post. Aruba's a great place with so much natural beauty.